I was so proud of my hubby a few months back when he came downstairs with a printed recipe he wanted to try. The name alone was crazy enough for me to love it immediately. Pannukakku. Go ahead, try and say it now. Just rolls off the tongue I tell you. This amazing Finnish pancake is a wonder to behold. In what other dish can you feed a room full of people with only four eggs?. Not to mention it impressively puffs up like a 3rd grade science experiment gone awry, only to collapse into a creamy tasty treat the whole family will love. No longer do you have to stand and flip endless pancakes and be the last one to eat! Just pour this extremely simple batter in a hot buttered pan and 30 minutes later you can all sit down to breakfast together. Genius. 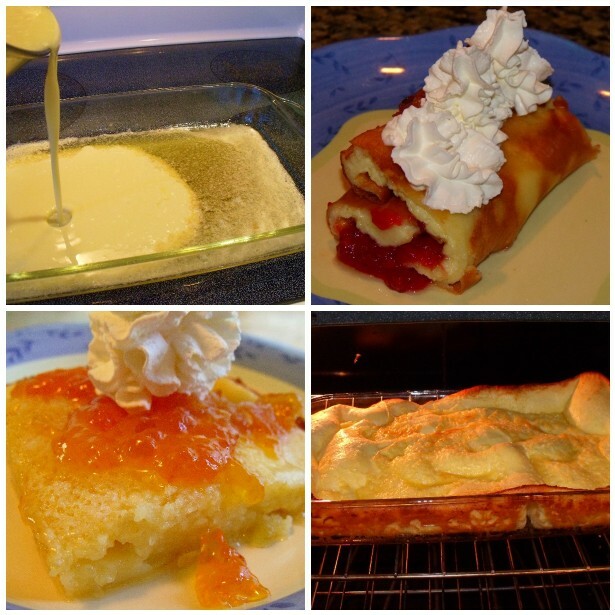 Pannukakku - Try making a Finnish pancake today!! What did we all do before Kitchen-aid mixers?? 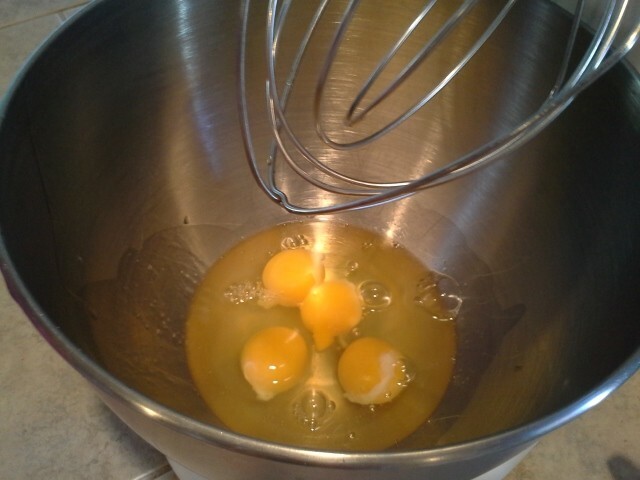 After the eggs are blended, mix the 3/4 tsp of salt, the 2 1/2 cups of milk, 1 cup of flour, and 1/4 cup of sugar. Keep checking on your butter. By now it should be melted and bubbling slightly. Gently pour your batter into the hot pan. Pour very slowly, it's 400º and butter splashes would hurt. After 30 minutes (check it at 25 minutes as oven times vary) it should be very puffy, and golden brown. Warning, taking this out of the oven in front of guests will garner "oooo's and ahhh's" from all those assembled. Once you gently pull this out of the oven and place on the stove top, some people (okay, people like us) were told to sprinkle a bit more sugar over the top, to get that tasty brule' effect. The sugar will melt into the hot pancake. The funny thing is, once this thing hits room temperature air, it will start to collapse. I have a hard time not thinking of the Wicked Witch of the West's dramatic line "I'm melting" as it sinks down in the pan. The edges will still stay poofy and golden though (my favorite part). Now you have some pretty hard decisions to make in the next few minutes. How to you serve and EAT your pannukakku? It's a tough job, but someone has to do it! Well there is the easy and traditional method very close to it's American pancake cousin, with butter and syrup! One time we rolled them up more like a crepe and put our garden strawberries and homemade strawberry jelly and whipped cream on them. That gave it a nice ultra fancy touch. Pannukakku the baked custard pancake. So needless to say, this easy little recipe has become a quick family favorite on the weekends. Comes together in just a few minutes and my favorite part is that you can sit down at the same time and enjoy it with your whole family. I'm sure you are thinking to yourself, hey I have FOUR eggs in my fridge right now... I could surprise my family tomorrow and dazzle them with something new! Let me know how it turns out and what you guys like to put on your Pannukakku! Full printable recipe found here. Jen, this recipe is amazing! I hate that your stove is so clean that you can take flash photos inside the oven!